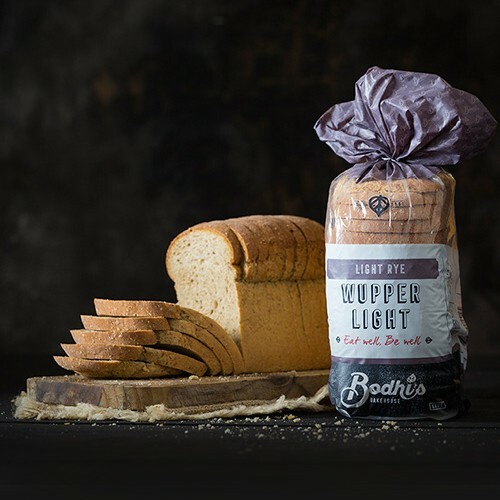 This bread is high in quality protein, omega 3 and lower in carbs than regular bread. Just 2 slices per day will provide up to 30% of your daily fibre needs maintaining an excellent digestive balance. Sprouted Mixed Grain with Fruit is made from 100% sprouted grains using only non milled flour. 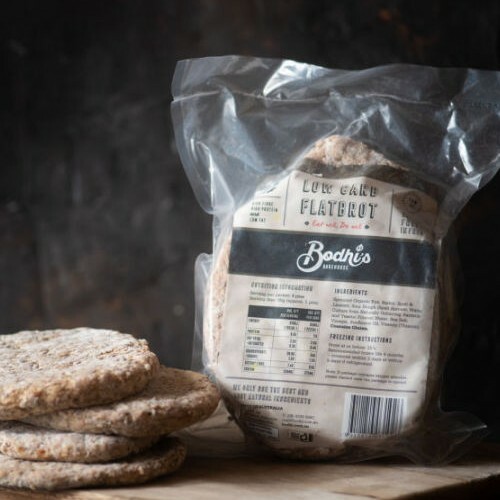 This bread is made with Wholegrain Spelt, Rye and Barley Sprouts, to create a rustic bread brimming with the healthy goodness of wholegrains and Sprouted Grains. The additon of sultanas and currents adds a whole new dimension to Bodhi’s original signature loaf. 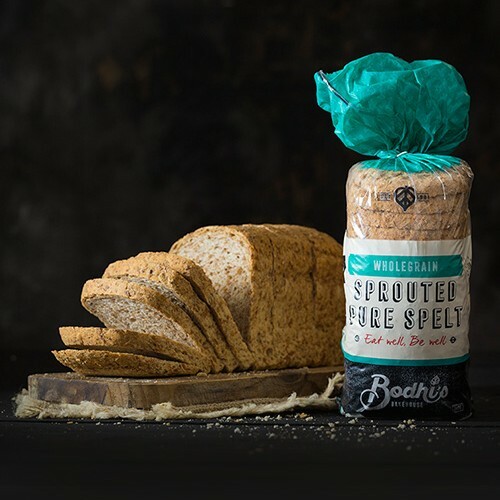 Our Sprouted Mixed Grain with fruit has a light and soft crumb with a fruity spicy taste and the subtle acidity of our Natural Spelt Sourdough. Serve it any time of the day, but try it for breakfast, toasted and topped with butter and jam! Good Source of of both Insoluable and Soluable Wholegrain Fibres, proteins & natural vitamins and minerals! 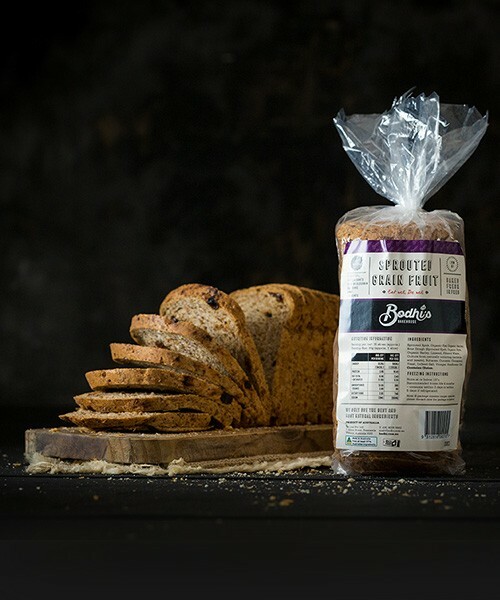 Eeating 2 or more slices of Sprouted Mixed Grain with Fruit Bread everyday may help maintain a better digestive balance by providing up to 30% of your daily fibre needs (whole grain fibre). 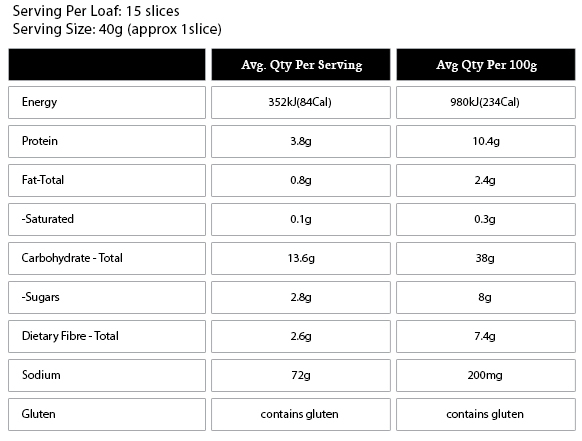 The bread is high in quality proteins, Omega 3 (Linseeds), lower in Carbs than regular bread and it is Low GI. Sprouted Spelt, Sprouted Organic Rye and Barley, Filtered Water, Spelt Sour Dough Sultanas, Currants, Sea Salt, Mixed Spice, Vinegar, Sunflower Oil.